Prior Scientific’s co-axial coarse and fine focusing block is designed for OEM applications where precise fine focus adjustment is required. Rack and pinion mount allows smooth, precise focusing over 29 mm of travel. A large coarse focus mechanism incorporates a slip clutch and tension adjustment. 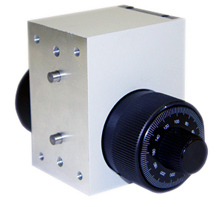 Fine focus adjustment control is graduated in two micron divisions throughout the coarse focus range. Motorized control is also available and is easily interfaced with Prior’s standard line of focus controllers. The focus block can be easily adapted to various mounting configurations.